The promise of live chat is extremely compelling… vetted, qualified leads at a cost of just $35. Who wouldn’t do that? I think it comes off as looking cheap. Unless the chat can respond to queries, it’s like calling your cable company and getting someone on the other end who can’t (or won’t) do anything of any value – frustrating. What we forget is that chat is a conversion tool, not a marketing investment and the cost of chat needs to be added to the marketing channel that generated the user. So we need to add $35 per lead on top of that marketing spend (PPC, Avvo Advertising, SEO etc.) So a $300 cost per prospect goes up to $335 – certainly not enough to break the bank, but not insignificant. More problematically – many firms view chat as a marketing channel and misallocate that conversion to “chat” instead of the marketing spend that generated the prospect. As a marketing agency, the best advice Mockingbird gives many of our clients is to stop spending money on marketing and instead, focus on converting existing leads into clients. And there’s simply nothing more effective at converting than immediately talking to a professional, knowledgable, empathetic, human who has a sense of urgency. 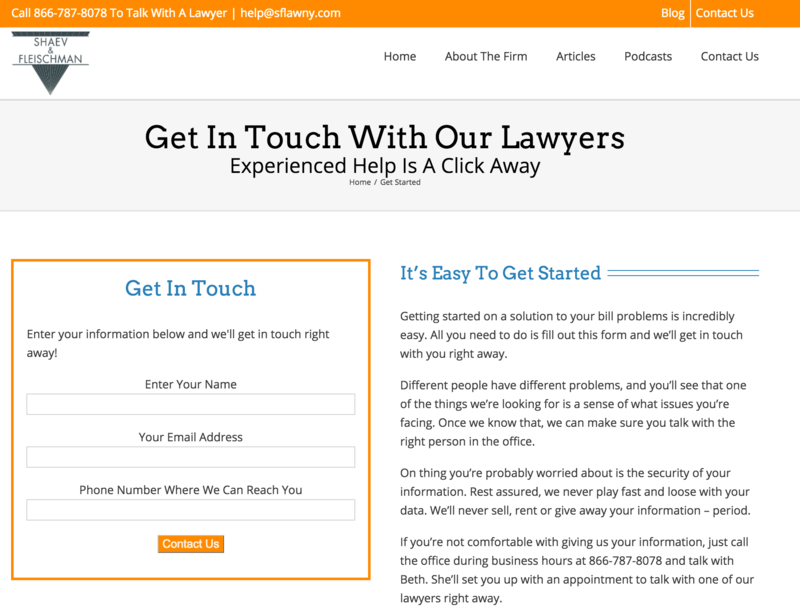 You have to realize there’s a good chance these people have filled out a contact form on your site and they’ve also filled out a contact form on three or four other attorney’s sites, and you might not be the first attorney who’s called them back. You have to approach it as though the competition has already gotten to that potential client. Increased cost/client – now that you are converting at a lower rate, your cost per client is increasing. Let’s (very conservatively) assume that phone calls are 25% more effective at converting leads than chat. Also assume you are spending roughly $1,000 in marketing dollars per signed client. The drop in conversion rate for those who chat instead of call increases your cost per client: $1,000/(1 – .25) = $1,333. Lost Business – and oh – lets not overlook the lost revenue of those prospects who signed with your competitor after calling them and immediately reaching a knowledgable, caring lawyer who made them feel taken care of. NOTE: Lawyers frequently complain about the volume of unqualified leads they receive and the expense in vetting those leads. Live Chat can be a very cost effective way of filtering out unqualified leads – say those from out of state for example. Given the cost per qualified lead billing model for Live Chat – the direct cost in filtering out unqualifieds is essentially zero. However, in my opinion, the benefit of converting qualified leads at a very high rate far outstrips the cost of vetting those unqualified leads. Finally, how effective is Live Chat in driving incremental business? Put more simply, how many additional qualified prospects on a firm’s website contact that firm through Live Chat, who wouldn’t have otherwise picked up the phone or completed an online form. Even being optimistic, I can’t imagine that number exceeds 1 in 50. The economics are pretty simple to analyze – $35 x 50 leads = $1,750 per incremental lead. Now assume that after actually talking with an attorney, half of those leads are really qualified and we’re up to $1,750/.5 = $3,500 per qualified lead. Finally, assume the attorney can close half of those qualified leads, and our cost balloons to $7,000 per incremental client. Remember that chat providers are optimized to maximize their revenue, not your business. If I were to utilize chat, I’d want to make sure it could do the following things differently from the typical chat install. Day-parting – activate only when my front desk wasn’t covered at night, or weekends – times when its hard to reach a person in my office and my conversion rates are lower than normal due to the lack of phone presence. Customizable Deployment – NGage is set to pop up within a specified time interval (I think 17 seconds) that has been tested to optimize the volume of chats. I’d want to be able to set rules for when it pops up – say a specific number of pages viewed, for example instead of aggressively bombarding users. Mobile – chat shouldn’t dominate the precious screen real estate of mobile phones. Chat on mobile is unwieldy at best and . . . the user literally has a phone in their hand, why on earth would you push chat instead? So, let’s come full circle and see how Jay Fleishman handles conversions on his own site. (And note – Jay is not a client, just a small firm lawyer I’ve known for many years who really gets marketing.) Here’s the button from his home page – note that it is user initiated, skipping the obnoxious take-over popup – kind of looks like chat, but built with the user in mind. And the button takes users to a mind-numbingly simple contact us form (below). Note both a phone number and email address built into his site’s header, so prospects have many different ways to contact Jay. Except of course chat, because Jay would rather talk with them directly. And so would they. I hope this has given you a framework to assess the efficacy of live chat for your own law firm – but have no illusions that the price tag is much higher than $35. Interesting article, I have a few comments I’d like to make on the subject. First let me declare an interest by saying that I am the founder of http://www.livechatmonitoring.com – we are a 24/7 live chat monitoring service, and I’ll certainly say that we are very different to the provider you describe in your article. 1. I think the incremental increase in lead capture is easily measured. I think 1 in 50 in incredibly conservative (and concerning), I can’t speak for other chat providers but I can tell you that clients of our service report an average increase in leads of 20-30%. We do see a reduction in the amount of phone calls after a client adds live chat to their website, however the average client will see a reduction of only around 10-15% (again, this is easy for the client to measure for themselves). 2. I agree 100% that the cost per lead needs to take in to account the cost of generating traffic to the website. However, live chat should also improve the conversion rate on the website so your overall cost per conversion should dramatically drop. The numbers in your article do not take in to account the increased conversion rates – if your live chat provider hasn’t improved conversion then I would suggest you find another provider immediately. 3. Decreased conversion rate….. Again my suggestion is that if this is happening you should change providers immediately! The purpose of adding live chat to a website is to engage website visitors and assist them with their initial questions (FAQ’s) and then capture the lead so that a member of the legal team can contact them to assist. I can tell you that our clients report the exact opposite to what you have described in your article, our clients tell us that many prospects actually stop shopping around after submitting a lead via chat as they feel that their enquiry has been received and passed on to the appropriate person for a call back. If the client treats the live chat lead as a priority and calls the visitor back promptly they will usually hear great feedback on how impressive it is to chat online and then receive an immediate call. Again this is easy for the client to test the value of the service – choose a chat provider that doesn’t lock you in to a contract so you can test and measure the value the service delivers. Clients should see an increase in leads, and an increase in conversions. 4. I agree that $35 per lead is high! Compare that to our pricing (www.livechatmonitoring.com/pricing) and you’ll find that our package for 40 leads works out to around $6.75 per lead. There are many different pricing models out there, and many different standards of service. We pride ourselves on offering customised scripting to deliver high quality leads to our clients, we also offer a co-managed option that allows our clients to log in and receive chats themselves while our team handles overflow and after hours enquiries. Conrad it sounds like you haven’t had the best experience with live chat providers, which is unfortunate because live chat truly is an amazing tool that adds immediate benefits to a businesses marketing efforts and should produce a very positive ROI for clients. If you’re open to it, I’d love to offer you two free trials of our 24/7 live chat monitoring service so you can test and measure the results for yourself. I am confident that our approach will change your mind on the value that live chat brings to a website!